We care about every single detail on our vehicle. So, wheels shouldn’t be neglected either. 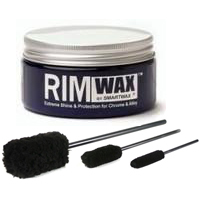 Take a look at our extensive Automotive Wheel & Tire Care catalog below to choose between wheel cleaners, rim waxes, brushes and more. Don’t let that road grim and brake dust take away from the appearance of your vehicle. Sweet, I'm in this one. I'll get bro in law pickup two pots for me when he shoots off to LA. He plans to be there the 1st week of Sept. We'll get a courier to pick-up. The wheel woolies are probably my favorite because you can actually get into the spokes and clean them pretty well while they're still on the car. Wheels are often neglected when cleaning the car and they're a very important detail!